Forever Unbridled (Unbridled's Song) wins the BC Distaff at Del Mar on 11.3.2017. John Velazquez up, Dallas Stewart trainer, Charles Fipke owner. Third in last year's edition, Charles Fipke's homebred Forever Unbridled brought home the garland in the 2017 Breeders' Cup Distaff. John Velazquez guided the mare to the front rounding the far turn, and they burst clear in the lane only to have to hold off a late run from Abel Tasman. Forever Unbridled had just enough left to win by a half-length at the wire, giving both Velazquez and trainer Dallas Stewart their second wins in the Distaff. Off at 7-2, the 5-year-old daughter of Unbridled's Song covered nine furlongs over Del Mar's main track in 1:50.25, paying $9.40 for the win. Post-time favorite Elate finished fourth at 2-1. 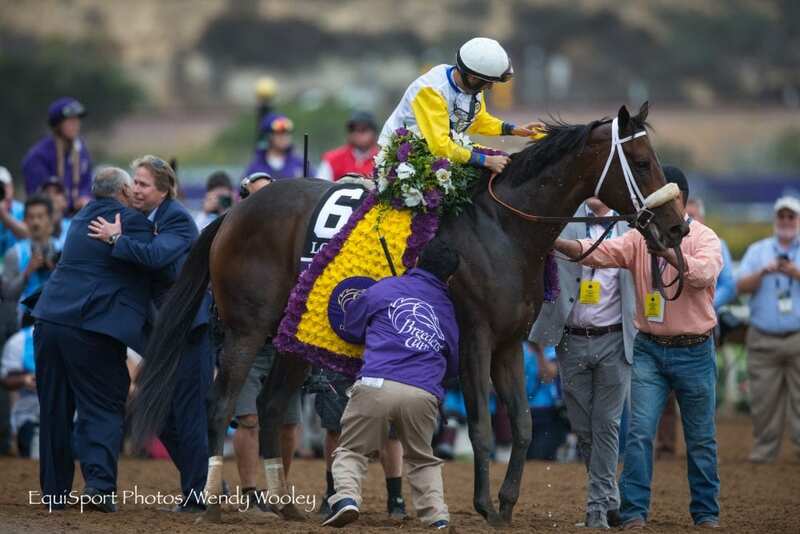 After a dramatic last-minute jockey change from long-time rider Joel Rosario to John Velazquez, Forever Unbridled never turned a hair in the crowded Del Mar paddock. 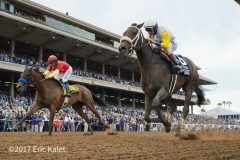 She left the gate with the field near the head of the stretch, but took some time to find her rhythm and was in front of only Abel Tasman crossing under the wire for the first time. On the front end in the first turn, Champagne Room had a one-length advantage over Paradise Woods, with Stellar Wind near the rail just behind them. Mopotism, Elate and Romantic Vision were three abreast, and Forever Unbridled was just behind them at the rail. Abel Tasman spotted the field nearly eight lengths in the early going. As Champagne Room set (hand-timed) fractions of :23.79 and :48.08, Paradise Woods began cutting into her lead. The advantage decreased to just a half-length down the backstretch as Mopotism jockeyed for position between rivals. Velazquez took Forever Unbridled off the rail in the backstretch, edging her her toward the far outside. Forever Unbridled took hold of the bridle a bit, but she settled back down for another sixteenth of a mile. Rounding the far turn, Paradise Woods drew up alongside Champagne Room on the lead. At the same time, Velazquez gave Forever Unbridled her cue, sending her after the leaders while four-wide to avoid the quickly-stopping Elate. Forever Unbridled jumped into the bridle and quickly put away Paradise Woods, jumping out to about a three-length lead. Abel Tasman and Mike Smith got to the outside in the stretch with clear running, and took dead aim on Forever Unbridled. Velazquez had timed his ride perfectly, though, and Forever Unbridled had enough left to win by a half-length on the line. Abel Tasman had to settle for second, and Paradise Woods held on to be third. Elate got up for fourth. Stellar Wind, second-choice in the wagering at 3-1, finished last in the eight-horse field. Bred in Kentucky by her owner, Forever Unbridled is out of the Kentucky Oaks-winning mare Lemons Forever (Lemon Drop Kid). Fipke purchased Lemons Forever for $2.5 million at the 2007 Keeneland November sale, where he first met her trainer and part-owner Dallas Stewart. The two immediately hit it off, and Fipke promised to send Stewart some horses. Read more about Stewart and the “unreal” Lemons Forever family here. Ten years later, both Unbridled Forever and Forever Unbridled (full sisters) are both Grade 1 winners. Forever Unbridled suffered a minor injury after her 2016 run in the Distaff, a small bone chip. She returned in June of 2017, and won both of her starts in the G3 Fleur de Lis and the G1 Personal Ensign. Off a long layoff, skipping the Beldame, Forever Unbridled came home victorious in the Breeders' Cup Distaff. “I'm just blessed,” Stewart said. “She's such a great filly. A championship was on the line and she's three-for- three. She ran great and I'm proud of Johnny (Velazquez) and how he rode her. Joel (Rosario) is a great rider and those are two great jockeys, but I'm focused on the horse. She's had that spacing and she's been very successful with that. Overall, Forever Unbridled has won eight of her 17 career starts, with three seconds and four thirds. The mare has earned $3,186,880, and her connections indicate that she could train on in 2018. It was suggested that Forever Unbridled would be considered for the 2018 Pegasus World Cup. This entry was posted in Breeders' Cup, NL Article and tagged Abel Tasman, Breeders' Cup, Breeders' Cup Distaff, champagne room, charles fipke, dallas stewart, Del Mar, del mar thoroughbred club, elate, forever unbridled, john velazquez, paradise woods, stellar wind, unbridled's song by Paulick Report Staff. Bookmark the permalink.